When I was a kid the thing I wanted most in the world was a dog. 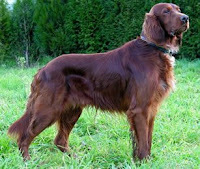 But my mom wasn't too keen on the idea of having a pet and my dad dislikes dogs on principle, so I was twelve years old before they finally relented and took an aging Irish Setter-mix off the hands of some family friends in the New York City. The dog's name was 'Sundance'. Sundance joined us in the suburbs in 1982 - and thus began her long reign of terror. My parents believed that an older dog would be easier to handle, since it would arrive pre-trained. They were mistaken. Sundance was a dog with many too many behavioral issues to possible chronicle here (my mother still visibly shudders whenever the dog's name is uttered) but she had one bad habit that was uniquely troublesome. Soon after arriving at our house, Sundance figured out how to open the bread drawer in our kitchen using her teeth. In the dead of night she would sneak into the kitchen, open the drawer, pull out several loaves of bread and then bury her "treasures" all around the house. Bread started turning up in the strangest places. At bedtime, you might find a nice loaf of Rye under your pillow. The first snows of December would unearth a few slices of Pumpernickel tucked behind the fireplace tools. Visitors would settle comfortably on the living room sofa only to discover a strange lump under the cushion and pull out a moldering mass of Pepperidge Farm Thin Slice. And I would think to myself "Why? Why, when I've waiting so long and so patiently to finally have the pet of my dreams would the universe bring me Sundance?" The answer, I've recently come to realize, was this: In order to prepare me for life with my husband David. You see, my husband is an engineer and when he is working something through in his mind he becomes extremely uni-focused. He gets so wrapped up in whatever problem he is obsessing about that his brain has no spare bandwith to wrestle with the simpler questions of life, such as where he should put his pants upon removing them or, say, where his wallet belongs. And so, like the dreaded Sundance before him, he spirits things away in hiding spots of his own devising, from which they may or may not ever return. Last Thursday, after hunting for half-an-hour for the remote control, I finally located it. In the refrigerator. And as much as I might enjoy spending the entirety of this entry lobbing stones at my disorganized husband from my own comfy glass house, there is one terrifying fact that I must face. David - - - is the organized one in our relationship. For someone like me, who was recently dumped by my cel carrier's insurance program for losing my sixth phone, a remote control in the refrigerator is amateur hour. When I was growing up my Uncle John would regularly pass by my room, look at me perched on my bed amidst the debris, and ask, "Was anyone hurt in the explosion?" In my twenties, a boyfriend broke up with me because, he explained, he no longer wanted to devote one-third of his waking hours to helping me look for my keys. And so it is, that for all the ways in which we compliment each other, the fact is that when it comes to personal organization, David and I are a bit of a match made in hell. Because we both understand that with a Snood now in the mix we don't have the option of letting things get too out of control. You might say, that the Snood is currently serving as a one-man (one very small man) "scared straight" program for the two of us. 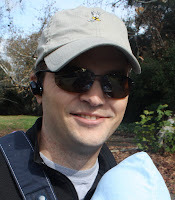 Turns out it doesn't take too may trips to the park sans diaper bag to realize that a change has gotta come! And we're slowly getting better. David now hangs up more pairs of pants than he leaves behind the toilet and I've started putting my keys on a special hook each time I walk in the door so I always know where they are. When I forget to do the dishes some days, David rinses them before bed. When David forgets to go to work some mornings, I gently shove him towards the door with his briefcase in hand. And so far this seems to be working out quite well. Which means, we hope, that my mom will never have to take us to "go live on a nice farm upstate somewhere where we can run and play all day". Oh, Sundance! You might have been the worst pet ever but, at least, I got a blog entry out of you! Snood is in the Hear-ar-ar-ar-art!